When last we saw this item, it was May 8th, 2008, and I was halfway through. It has actually been finished for more then a year, but has been stuck in the back of Devil's drawer wadded in to a ball. 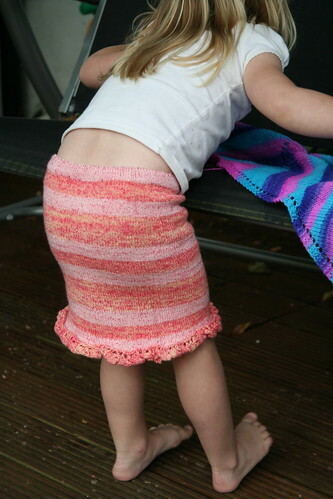 I guess knit skirts, even when done in a wool-cotton blend, are not suitable for Houston weather. 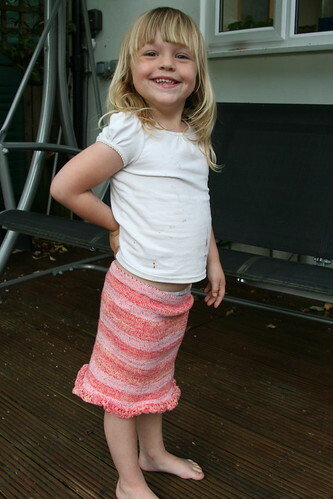 However, it is quite a bit cooler in London*, so last week when I had the opportunity to pick out her clothes for her, I choose this skirt, and she decided she quite liked it. Pattern: Flip, by me, but it's not really a pattern so much as a knit tube with an edging added to the bottom. Gauge: 7 st/in, row gauge? Comments: From my notes on this project, I see that I got 8 sts/in with US 1.5s so I choose US 2s to get 7 sts/inch. I cast on 150 stitches and did a picot hemmed top edge by knitting for about an inch (8 rows), then working k2tog, yo all the way around. After the yo row I knit straight, although about halfway back down the width of the waist band I did another k2tog, yo to make a hole for a drawstring to go through. I then knit straight, increasing 7 sts/row approximately every inch (every 7 rows, how's that for symmetry?). I knit until it looked long enough, then spent several days a little while charting the edging. I finally went with a leaf edging from BW #2, and since it was worked perpendicular to the rest of the skirt, didn't require a specific number of stitches around the bottom. The nice thing about this "pattern" is that it can be done with any yarn and any needle size you want. Just figure out your gauge, cast on the number of stitches needed for the waist and get going. Increase approximately 1 inches worth of stitches every inch or so, and keep going until you get the desired length. Finish with edging or not as desired. Finishing: I sewed the picot hem closed, including an elastic waistband to help keep it up. Then I threaded through a lovely pink ribbon to finish it off. The ribbon came out the first time it was worn and is who knows where in our as-yet-to-be unpacked stuff. Eventually I'll find it and put it back, but an i-cord drawstring would also work well. 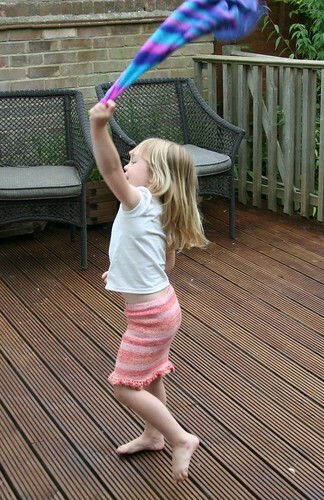 If you end up making one of these little skirts for a small one in your life, please send me a picture or let me know . I'd love to see them! * This may qualify as the year's grossest understatment. Written by porpoise On July 9, 2009 In "Devil", "FO", "designs"